Mike Walton (otherwise known to Scouters on and off the Internet as "settummanque (set-tum-man-quay), the blackeagle") has had a long and quite exciting life - in and out of Scouting. The son of a professional beautician and a second-generation Army soldier, Mike has been involved in various youth programs since age 8. One of the first regular contributors to the Scouts-L youth programs discussion list in 1990, Walton continues to offer advice, support and information to Scouters around the world. He is the webmaster of the Leaders' Online and the Badge and Uniform sites, as the webmaster of his own personal site called "The Tree" and two military-related websites. Walton is also the author of several books, including "Patches and Pinsâ€¦", "The Commandments, those Laws and My Rules", "Settawho?" and "Eagle Feathers", all which are awaiting publication dates and final edits; an anthology of short stories with six other authors called "Brewed Awakenings"; and four unpublished books. Walton was the editor of the first attempt to explain the process toward becoming an Eagle Scout, called "EagleTips" -- a series of email postings and written content provided by Scouters for Scouters working with youth toward the Eagle Scout Award. He has served as a volunteer Scouter at the Pack, Troop, Team, Post and Ship levels; as a member of several District and Council-level operating committees; as a volunteer serving two Regional Areas, two Regions and on five National-level committees or task forces. Of note, he has participated or served on staff of every National Jamboree since 1973 and has attended three World Jamborees. Additionally Mike served for almost four years as a Paraprofessional Executive working with rural and inner-city communities within eight local Councils in western West Virginia, southwestern Virginia, Tennessee, and Kentucky. He has been blessed with service overseas as a Lone Boy Scout as well as a unit Scout and later Scouter within the former Direct Service and as a Scout and later Scouter within the Transatlantic Council in Europe. Walton was selected and served twice as a contingent leader for several European Scouting camping programs and served as the Transatlantic Council's contingent leader for the 1985 National Scout Jamboree. For these efforts, the Transatlantic Council honored Walton with the title "sekkettummanque", which in the language of the Delaware Indian, means "blackeagle", a true testament to Walton's Scouting experiences and support of central European camping programs. Walton shortened the title to "settummanque" (removing the two "k"s and an "e") to meet the 15-character limitation for student electronic mail account names at his alma mater, Eastern Kentucky University. A Brotherhood member of the Order of the Arrow, Scouting's national camping service organization, Walton frequently talks with parents of Scouts about the importance of Scouting in contemporary American society. Walton enlightens families and organizations with stories featuring his and others' Scouting adventures and "things to bring from the program" and is a popular public speaker. Mike Walton has earned the Arrow of Light, Eagle with five palms, and is one of the first Exploring Achievement Award recipients. He is also the holder of the William T. Hornaday gold medal; the Certificate of Heroism (which was later upgraded to a Heroism Award); the Youth Leadership in America Award; the God and Country youth religious award and several adult religious emblems including the Bronze Pelican Award from the Catholic Church and the God and Service Protestant adult service award; the Den Leaders and Den Leaders' Coaches' Training Awards, the WEBELOS Den Leader (Training) Award and the Cub Scouter (Training) Award; the Scouters' Training Award as a Cub Scouter, Boy Scouter, Exploring leader and Sea Exploring leader; the Scouters' Key Award as an Explorer Advisor, Scoutmaster and Commissioner; the Scoutmaster Award of Merit; the Spurgeon, Bronze and Silver Big Horn Awards and Silver Scouter Exploring Awards; two Council, a Regional and National Exploring Leadership Award; received several Commissioner awards including the earned Doctorate of Commissioner Service; is a holder of two District Awards of Merit and the Silver Beaver Award and many other recognitions and awards. 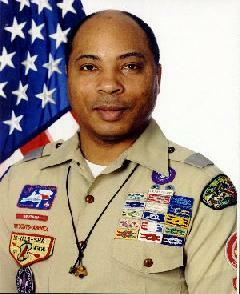 Walton also received service awards from the Iraq, British, Honduras, Netherlands, and a German Scout Associations. He is also a Wood Badge and Sea Badge holder and is a former National Camping School and National Exploring Instructor graduate and regional leader of the Intercamp Scouters' Club. Walton also holds awards from several military professional associations, from another outdoor group, and from the United States Army or its reserve components for leadership, service and personal achievement. Walton, a parent currently to ten (and eventually to three more within a few years), makes his home in the South Lake Minnetonka area of Minnesota but hails from Rose Terrace Community, Fort Knox, Kentucky. After serving for close to 30 years of service (thirty-six if one includes Junior and Senior ROTC training/service) as a part of America's Army, Lieutenant Colonel Walton transferred to the Retired Reserve in early 2011 and was hired by the Air Force shortly afterward. Mike Walton is stationed currently as Deputy/Operations Public Affairs Chief for the Air Force's premiere testing and engineering facility in south-central Tennessee; but has "hip pocket orders" which frequently returns him to Europe to support the public affairs efforts within the U.S. European (EUCOM) and U.S. African (AFRICOM) Commands (and to support the Transatlantic Council BSA on his off-time).